We've long talked about mobile being the "future of retail." Now that this future has arrived, what's next? At this year’s Shoptalk in Las Vegas, I shared how today’s ever-curious, demanding and impatient shopper is moving and buying online, in stores, and even hands-free with their voice—creating opportunities for retailers to assist them in ways never before possible. Google has already made big investments in retail, and today, we’re the #1 driver of traffic and transactions to retailers’ sites in the U.S. But we want to create more value for the retail ecosystem, by combining our technology and deep understanding of what customers want with retailers’ unique products to make shopping truly seamless. Check out our updates from Shoptalk that highlight how we’re partnering with retailers to help deliver these shopping experiences for customers everywhere. Help shoppers take action, wherever and however they choose to shop. 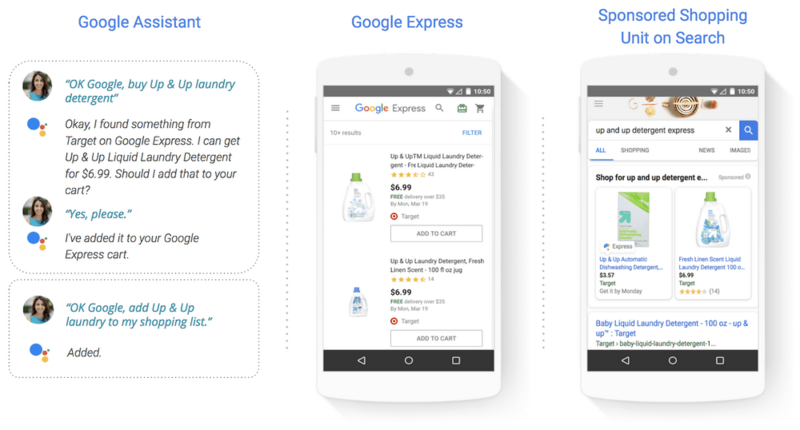 Shoppers findretailer products on Google in a multitude of ways—from Search’s sponsored Shopping Unit to YouTube to their Google Home device. But while they may be used to all these modes of discovery and buying, shoppers still prefer a frictionless, end-to-end shopping experience—and they gravitate toward retailers who provide it. Our new Shopping Actions program offers shoppers an easy way to shop retailer products across Google surfaces with a universal cart, whether they’re on mobile, desktop or even through voice via the Google Assistant, on devices like Google Home. Shopping Actions appear within the sponsored Shopping Unit on the Google Search page. No organic rankings are impacted or changed. Check out our full post on Shopping Actions, or sign up here to learn more. What if shoppers could visualize their furniture from the comfort of their home? ARCore 1.0 gives retail developers the tools to build powerful augmented reality apps for Android phones as the virtual, digital and physical worlds come together. It now works on over 100 million devices, on more than a dozen different smartphone models around the world. There are lots of great examples of AR powered shopping interactions today. Pottery Barn lets shoppers use AR to easily change the color and fabric on furniture to decide which looks best, and they can purchase directly in the app. You can find other retailers with shopping experiences built on ARCore, like IKEA, Jet.com, Lowe’s, eBay and more on the Google Play Store. To learn more, check out our full blog post here. When we launched Google Pay, we wanted to make paying fast and simple for as many people in as many places as possible. Transit was a big part of this vision, which is why we’re thrilled to partner with NXP to offer transit and prepaid tickets or passes on Google Pay. Las Vegas is the first city to support this feature, which is powered by NXP’s new MIFARE 2GO Cloud Service and contactless technology. 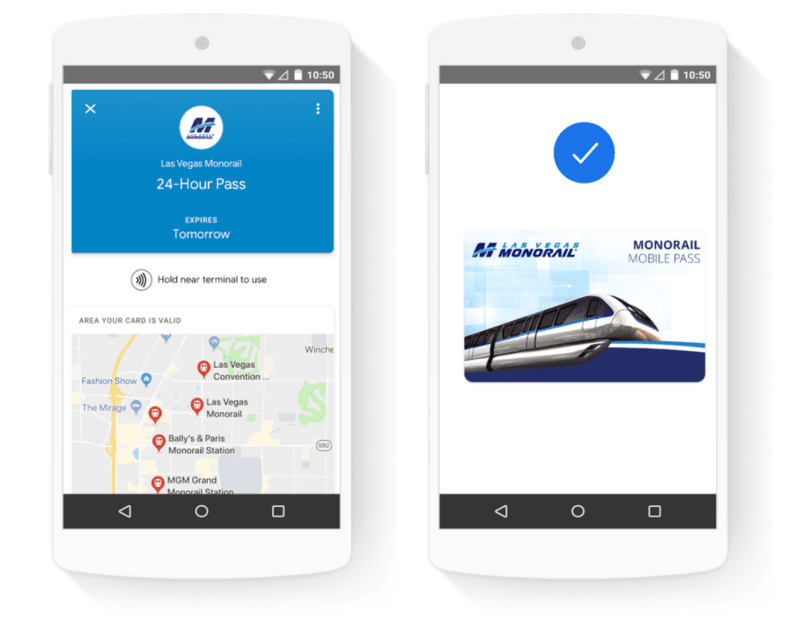 Now, people can purchase Las Vegas Monorail passes online, save them to Google Pay, and use their phones to ride. What makes this good for retailers? Habit. We’ve found the more people use their phones to ride transit, the more they’re willing to use their phones to pay in stores, according to internal Google research. Building a new habit in one area makes them more likely to apply it to another. And as we expand transit to more cities, we’re excited to see how this affects mobile payments at all the places people shop. Underpinning this all, we’re continuing to grow Cloud with our partners in mind. We know the best shopping experiences rely on using data to provide these frictionless, personalized ways to shop, which is why we’ve made all the tools we use ourselves—unparalleled machine learning capabilities, analytics, raw computing power and scale—available to retail partners. Retailers are at the heart of building easier, more seamless shopping experiences for shoppers. By combining Google technology with industry expertise, we’re helping ensure these experiences are focused on the only audience that matters—the customer. 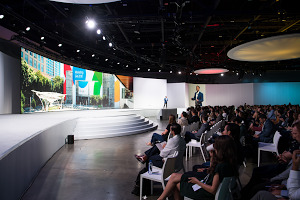 Google Cloud can offer retailers true partnership on an open platform that gives shoppers both choice and convenience. 1. Based on data from Google Analytics accounts that have authorized Google to share website data in an aggregated way. US only. January - December 2017.